Choose from our choicest range of beautiful outdoor blinds shades to suit your space and budget. As one of the leading outdoor blind company, our products are designed to shield against high winds, UV rays and severe sunlight, making your living space more resourceful. Irrespective of the location or position of your living area, exterior blinds are an efficient all-weather solution regardless of windy or coastal, hot or cold weather conditions. We end up paying excessive cooling costs to keep our homes comfortable during the blazing summers. Complete Home Improvement has a wide array of cheap outdoor blinds in Sydney, designed and demonstrated to keep your home at a cool and constant temperature all through the summer months. The sleek, minimalist and contemporary lines of vertical blinds from Complete Home Improvement will harmonise any decorating approach. Select from our awesome range of sturdy, low maintenance fabrics in exciting new-season colours, patterns, and textures. Outdoor vertical blinds in Sydney are made as per your precise measurements and are an excellent option for controlling the direction and amount of light entering your home. The lightly coloured and clear cafe blinds will shield you from the components without compromising on your splendid Sydney views. Our design will enable you to pull up or down your blinds as per your convenience. If you want to know how café blinds can change the look and feel of your home, explore our gallery. By enhancing the adaptability of your current living areas whether they are indoors or outdoors, outdoor blinds lend value to your home without the requirement of altering your floor space. Outdoor blinds can surround a balcony or patio from brutal essentials, making the area usable all through the year. Shielding an indoor living space from the components while facilitating tender airflow, they can enhance comfort in the space you already possess. 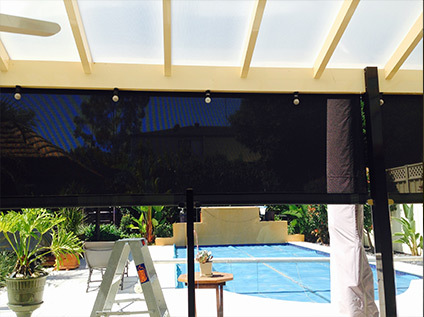 If you need assistance with outdoor blinds in Sydney or other home improvement solutions like sunroom extension, patio screen enclosure, and outdoor decking, get in touch with Complete Home Improvement on 1300 912 293.